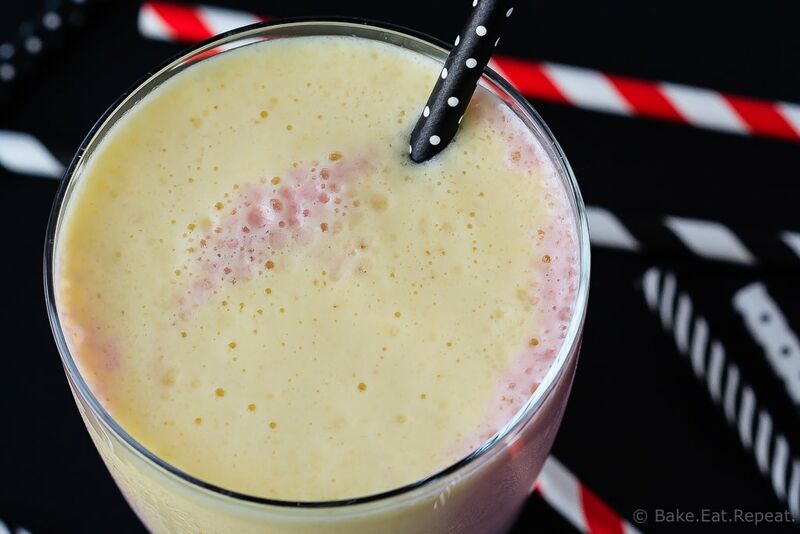 Pineapple Strawberry Smoothie - Bake.Eat.Repeat. 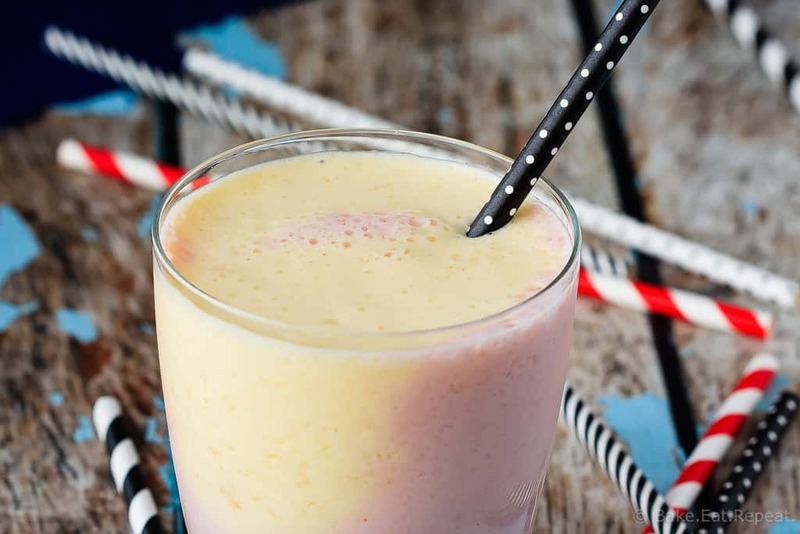 The perfect quick breakfast or snack, this pineapple strawberry smoothie healthy, tasty and filling – and so pretty with it’s swirly layers! I’ve been on a bit of a smoothie kick lately. Pineapple strawberry smoothies to be exact. I find I go in phases when it comes to smoothies. Well, most things I suppose. I decide something is amazing and make it everyday for a while, and then don’t make it again for eons until I suddenly remember this fantastic thing and wonder why I haven’t made it in so long. Did that even make sense? Am I the only one who does this? Or is that a fairly common thing, to LOVE something for a while and then not want it anymore? And then remember it and need it all the time again? At any rate, that’s definitely something that I do. I honestly don’t even remember the last time I made a smoothie before a couple of weeks ago. And then I remembered this Oatmeal Orange Smoothie and thought I should make that. And then I started seeing pictures of beautiful smoothies all over Pinterest (must be getting warmer or something! ), and I suddenly started wondering why I hadn’t made a smoothie in so long. So I immediately set about to remedy that. 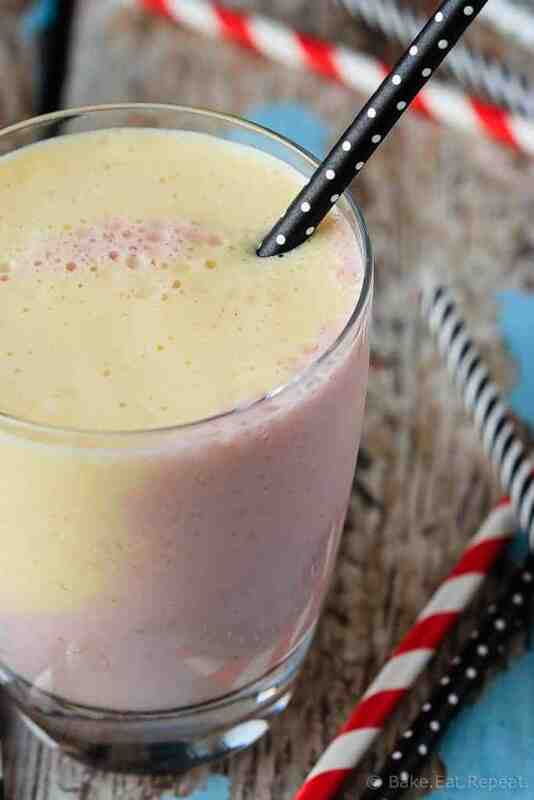 With this lovely pineapple strawberry smoothie. I’ve never actually made a pretty, swirly, layered smoothie before. To be perfectly honest I kind of thought it looked like more effort then is strictly necessary for a quick breakfast drink. Why bother? You know what though? It’s pretty. And kind of fun. And not hard. Really not much more effort. Plus, it’s pretty fantastic getting two smoothies in one. Yup – smoothies are back around here for a while. I’ll get bored again in a few months, but hey – that’s just the way I operate! The perfect quick breakfast or snack, this pineapple strawberry smoothie healthy, tasty and filling - and so pretty with it's swirly layers! Blend all of the ingredients for the strawberry portion of the smoothie in a blender until smooth. Divide it between two glasses. Blend all of the ingredients for the pineapple portion of the smoothie and layer it on top of the strawberry smoothie in the glasses. Enjoy! You may or may not need to add some honey to sweeten your smoothie, it will depend on personal preference and how sweet your fruit is. I have found that we like a little honey in the pineapple portion of the smoothie, but the strawberry portion doesn’t need it. I always use frozen fruit for my smoothies, if yours is fresh you will definitely want to add some ice to thicken it up. You can just leave it out if you don't like it, it won't make much difference. Maybe use vanilla yogurt instead of plain yogurt if you want that slight vanilla flavour. I've made it both ways! I've been on a smoothie kick lately, too! It's so fun to experiment with new flavors. I've never tried using pineapple before, though! This combo sounds so good, Stacey! Perfect for breakfast or a mid-morning snack!